A former Scottish Labour leader has criticised Jeremy Corbyn for what he regards as the party’s failure to root out anti-semitism. In an unusual move, Jim Murphy paid for a full page advert in the Jewish Telegraph to highlight his concerns. UK Labour said they would not be commenting on the advert. 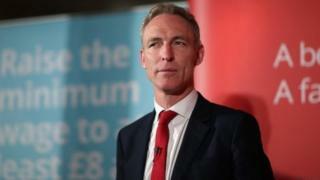 Mr Murphy, who led Scottish Labour to a disastrous election result in 2015, said the current Labour leadership had done so much to damage its relationship with British Jewry. He also accused Mr Corbyn and his top team of being “intellectually arrogant, emotionally inept and politically maladroit”. Recently, the focus has been on a new code of conduct the party has adopted on anti-Semitism, with critics concerned that it does not go as far as the International Holocaust Remembrance Alliance’s (IHRA) guidelines. The Jewish Leadership Council and Board of Deputies have accused the Labour leader of “ideological hostility” to the IHRA definition of anti-Semitism and its 11 examples. While Labour’s code has adopted the definition, it misses out four of the examples.